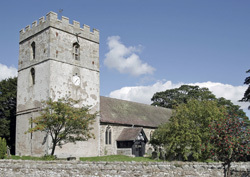 The eastern side of the nave is 12th century, the chancel and tower are Early English. The porch is dated from 1639 and the great door 1648. There is an unusual carved Jacobean pulpit, a Victorian font, and splayed Norman windows. The monument to Chief Justice Leighton, 1607 is the earliest of its kind in Shropshire. Car parking at the village hall opposite.